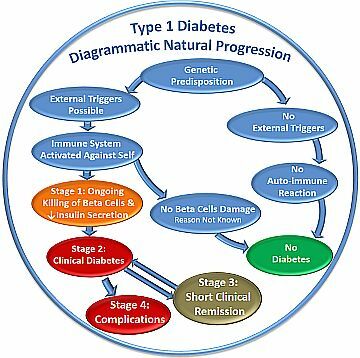 Type 1 Diabetes (T1D) progresses through 4 stages. Stage 1: Pre clinical - onset of metabolic derangement. 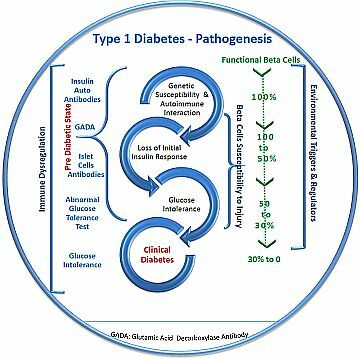 Autoimmune mediated ongoing destruction of beta cell jeopardizes insulin secretion and leads to abnormal glucose tolerance test. Less than 30% of insulin secreting cells are functional. Child presents with signs of glucose intolerance and metabolic disorder. Stage 3: Transient remission phase, "honeymoon period". Shortly after starting Insulin therapy in a newly diagnosed case of T1D, suddenly child’s own insulin secretion improves sufficient enough to maintain optimal blood sugar levels. This phase is short lasting, and child reverts back into full blown diabetes. In spite of judicious regular treatment acute and chronic complications are commonly noted in Type 1 Diabetes cases. Type 1 Diabetes attributes for 85% of all childhood diabetes cases. The clinical disease commonly appears during middle childhood, at the onset of puberty or through teenage development. But it can present at any age. 50% of all T1D cases have clinical presentation of the disease during adulthood; usually below 30 years of age. The incidence of T1D is on the rise all over the world. An average yearly increase of 1.5% has been documented. Western Europe, USA and Australia have higher incidence than that in Asia, Africa and South America. Documented prevalence of clinical diabetes of type 1 variety. It varies in different countries for various reasons. And the statistics are changing far too rapidly for me to pinpoint what percentage of children are likely to be affected. However, a rough estimate would be; 1 to 3 children could be hit by the disease in group of ten thousand. Protective effect of common childhood infections have been noted. Strict hygiene jeopardizes the health benefits of good bacteria on our immune system. 1. Goodness of mother’s milk. 2. Human milk is a natural prebiotic. 3. Delay in exposure to cow’s milk protein. 4. 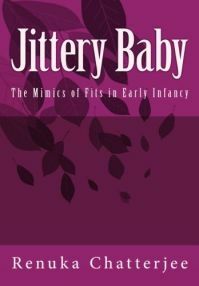 Helps delay introduction of weaning foods, especially those containing gluten. Adequate vitamin supplements through child's early development phase.